Not all signs are created equal, and we’re not just talking about the ones we create. Some signs simply signify the location or nature of a business or place. Others are legendary icons that have earned a place in history, as well as modern culture. The following six signs are some of the most famous in the world, representing everything from hedonism to international diplomacy. Erected in 1923, the Hollywood sign was originally a business sign built to advertise an upscale housing development called “Hollywoodland,” which is what the sign read until 1949. Four thousand 20-watt light bulbs on the letters illuminated the original sign, which cost $21,000 to build. In 1978, just five years after a complete makeover, the sign suffered attacks by termites and arsonists and was completely rebuilt for $250,000. The Hollywood sign remains a cinematic emblem today, representing the film industry and all of its storied glamor. The flag of the United Nations appears around the world, but its most famous location is in front of the U.N.’s New York City headquarters. Erected in 1947, the flag represents all of the people of the world living in peace, symbolized by the olive branches. U.N. personnel use the flag for protection during peacekeeping missions in armed conflicts. There are few cities in which neon signs are more plentiful than Las Vegas, but one in particular stands out from the rest. 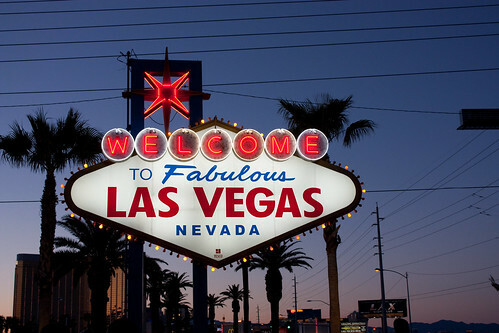 The “Welcome to Fabulous Las Vegas” sign, built in 1959, is actually located in the adjacent town of Paradise at 5100 Las Vegas Boulevard South. A neon sign salesman came up with the idea when he noticed that all of Vegas’ neon signs advertised casinos rather than the city itself. Located in London’s Kings Cross railway station, the Platform 9 3/4 sign is a nod to the Harry Potter cultural phenomenon. Originally located on the train platform, the sign drew so many tourists that it was interfering with passengers riding the trains and had to be moved. Now, the sign is located on a brick wall with a luggage cart passed halfway through it. A Harry Potter gift shop is next door. Commissioned in 1926, Route 66 is probably the most famous highway in the world, and its signage is as iconic as the road itself. Known as “The Mother Road,” Route 66 originally spanned half the country, almost 2,500 miles. The black and white Route 66 sign and all its attendant nostalgia can now be found on everything from pajamas to shot glasses.